Cook 12 oz uncooked penne pasta as directed on package until al dente. Drain. In large bowl, combine drained cooked pasta, 1 lb boneless skinless chicken breasts, cooked, chopped, 1 jar (15 oz) Alfredo sauce, 3 tablespoons chopped cooked bacon, 1 egg and 1 teaspoon pepper; stir gently to combine. Pour mixture in baking dish. Bake 20 to 25 minutes or until hot and bubbly. Remove from oven. Top evenly with remaining 3 tablespoons chopped cooked bacon and 1 cup grated fresh Parmesan cheese. Sprinkle chopped fresh parsley over top before serving. Use pre-cooked chicken or a deli rotisserie chicken to help save time! Use chopped pancetta (Italian bacon) instead of regular bacon for a more savory flavor! 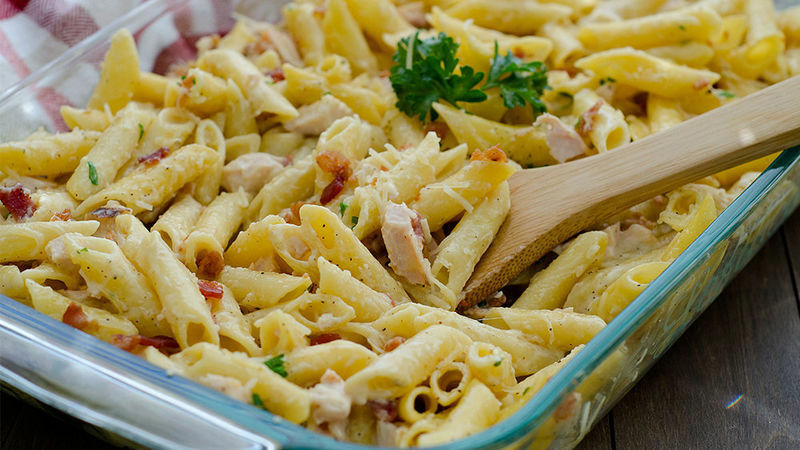 You don’t have to go to Italy to sample this chicken carbonara recipe. The origin of carbonara is still a mystery, but we’re happy it’s still popular today, and is even easier to make in your own kitchen. 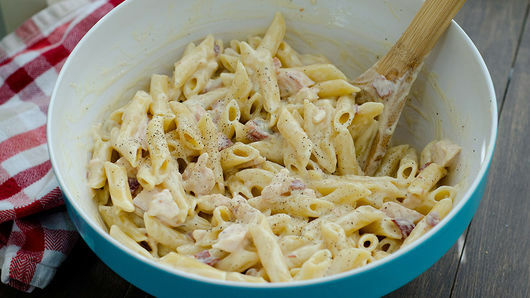 The word “carbonara” refers to the pasta sauce which is made by combining bacon, egg and cream. 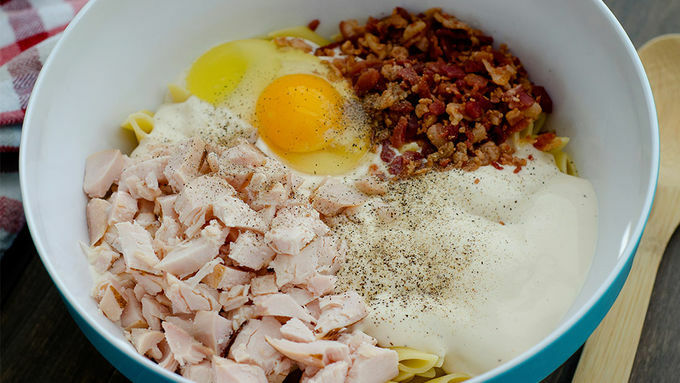 The combination of the creamy Alfredo sauce, bits of bacon and egg make this dish a true carbonara feast, and the added protein from the chicken helps to keep you satisfied. This recipe proves that bacon and chicken together is never a bad idea. Feel the same way? 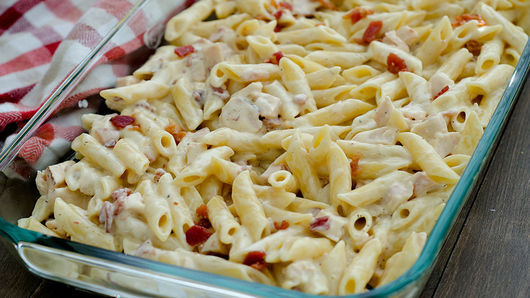 We have more recipes you’ll enjoy like our Chicken-Bacon Alfredo Penne Casserole or this Bacon Chicken Bake. There’s no need to chicken out! Whether you’re a novice cook or an expert, our easy chicken recipes are made for every level.